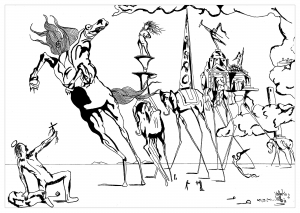 Discover simple coloring pages for kids inspired by the greatest works by Salvador Dalí (1904 - 1989). This Spanish Surrealist painter is one of the most controversial and paradoxical artists of the twentieth century. In his paintings, he depicted a dream world in which various and simple objects are juxtaposed, deformed, and even metamorphosed in a bizarre and irrational way.